Thanks to everyone for a great meeting: Michael, Jason, Sophia, Benny, Topher, Ricardo, Alex, Alec, nublabs, and everyone else. DIYbio 2 & 3 were focused on gel electrophoresis – we started by researching all the amateur gel protocols we could find online (notably the MacGuyver Project and the MAKE protocol, the latter of which we decided to focus on) and making a shopping list of materials we would need to build the complete gel apparatus, make a gel, and stain DNA. We got Agar agar powder from a health food store on ebay and Potato Dextrose Agar and sybr green from a lab equipment reseller on ebay. Basically we over-stained the gels with methylene blue and couldn’t visualize anything because the entire gel was a solid blue. Also, we used metals that were way too reactive as electrodes in the gel box and the redox reaction that they enjoyed probably ruined the voltage field across the gel. That said, I think we accomplished a lot, learned a lot, and somehow managed to do everything the protocol required in a spontaneous, parallel way – to me, that was the best part about the event. I remember stepping back at one point and being amazed at how well everyone was working together without any central plan: Topher and Jason were improvising with the stovetop and microwave to boil the agar, Sophia and Mike were cutting up charlie cards to make gel combs, and Benny, Ricardo, and the nublabs crew were constructing and taping gel trays and boxes. It was awesome. 1. We were not as rigorous with the materials as we needed to be. One of our main problems was getting the concentration of the gel just right, which was difficult because the packages for our agar didn’t list the original concentrations. In general, we followed the MAKE protocol too specifically while using supplies that came with ambiguous descriptions at best. DIYbio protocols we develop should be designed to help the user understand the basic principles of the operation in a way that enables them to improvise successfully with non-standard materials. 2. We should have had a solid understanding of how to dispose of all the materials involved before beginning as well as exactly what the potential risks involved were (very low – probably the biggest risk was spilling molten agar) and what to do in case something went wrong. 3. It would have been better to have built all the equipment in one meeting and then used it in a second. Trying to do both was a little too long. Next week we are going on a tour of the Boston FabLab, courtesy of our friends at NubLabs – meet at the FabLab at 7:00pm on Thursday, 17 July 2008.
p.s. go comment on the flickr photos! try lego as a frame, as in the make protocol.I suggest using cybrsafe as a dye and bluelight (LEDS!) to show the bands. This should be more sensitive than the equipment most labs are using.Use Borax as the buffer, it is cheaper than TBE and probably easier to get, though I am not completely sure about that. I ran across your site and find the whole idea of making molecular biology techniques accessible to the amateur extremely interesting. However, I think a key to successfully pulling this off and being able to carry out meaningful experiments far cheaper than institutionally based research will be learning where to skimp on materials and where to simply go for the real thing. Several hundred dollars for a gel box is just ridiculous and I have no doubt that you can make your own for far cheaper that will work very well. 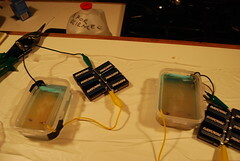 Building your own gel box is a case where you get far, far more value for your money by DIYing compared to buying off-the-shelf apparatus. However for reagents and materials, I think there is less value to be gained by using “household chemicals.” From looking on eBay and googling chemical names, it seems like for a few hundred dollars anyone could put together a collection of the chemicals necessary to make common buffer solutions (for example the components of TBE running buffer), gel material (acrylamide or agarose), a reagent such as ethidium bromide to visualize DNA, and a scale which can measure to sufficient precision to be useful for basic applications. These reagents typically come in fairly large bottles that take university lab groups a while to go through and should last you for a long time. In other words, for a surprisingly small sum of money, you can follow standard protocols. In minutes, you can prepare any concentration of agarose gel you want (weigh out the proper amount of agarose for the volume you’re using, mix, and microwave). The place where money can really be saved is on overpriced apparatus that’s only expensive because it’s marked “scientific.” When you obviously have such a cohesive group of people working together in real life, everyone chipping in $50 would be enough to assemble a collection of reagents that allow you to simply follow the same protocols used by established labs. Then, the focus can turn from producing “home versions” of simple protocols to performing useful experiments far more quickly. I just left a message at another thread with the comment that I would propose(work on) a remotely operated lab that would allow people in areas with too few diybio types to avoid the lack of economy of scale and share lab space. A sample system of this type would be Mosis which will process chip designs for those without chip manufacturing infrastructure. Unless you want to publish your results, which would probably go more smoothly if reviewers saw you were using bonafide supplies and protocols, there may be instances where the cost difference between biotech and retail supplies makes a big difference. Remembering my thesis budget, all those things add up fast. I wouldn’t want ethidium bromide around my home (garage, storage unit, hackerspace) after all the warnings we got about it in lab. 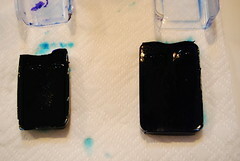 It’s highly toxic and mutagenic, and it’s hard not to make at least some mess when soaking/rinsing the gels. I’d worry about how to dispose of leftovers, too. There is a fair amount of information on substituting food-grade agar for lab-grade agar in the diybio faq. At long last! We’ve been trying to find facts on lego for quite a while and found it, my son will be thrilled! Hi there, Im at my work and was surfing around the net, goofing off, when I came over your web page. It’s quite nicely executed, and I certainly like your way of writing. ggrow! » DIYbio - Jetzt wird Biotech gehackt!